Did Jesus really die on the cross? - hisreturn jimdo page! Can you prove Jesus rose from the dead? Did the disciples really see a risen Jesus? Did Jesus really die on the cross? So far we have determined that all possible explanations that the disciples didn’t really see Jesus risen three days after His death have serious flaws and are not logical choices. Now I will look at the possible explanations that they really did see Jesus after His crucifixion. There are two possible explanations, either it’s true He really did die and was risen proving His claim to be Son of God, or there was some mistake and He really didn’t die on the cross. There have been theories put forth, one was made popular by the recent book and movie The Da Vinci Code, that Jesus didn’t die. That when the disciples saw Him later they assumed He had risen. Some may sound possible on the surface, but if you look closer they all are flawed and unfeasible. 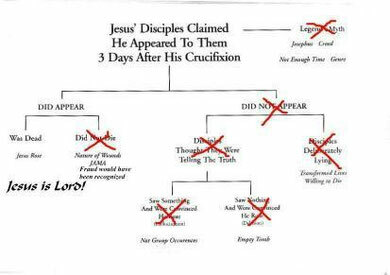 One theory that I’ve heard is that Jesus really wasn’t dead when He was taken off of the cross. Instead, He was in a coma or a state of shock appearing to be dead. When He was wrapped in the burial cloth and laid in the tomb, the warmth of the cloth and the rest in the tomb revived Him. Sound possible? Not really. First of all, the soldiers in charge of the crucifixion were professionals who had done this many times. They knew how to tell if someone was dead, in battle their lives might depend on it. Also the Journal of the American Medical Association vol.255 March 1986 had an article titled “On the Physical Death of Jesus Christ”. In this article medical experts looked at the Roman practices of scourging and crucifixion and determined that nobody would be able to survive. But still it is possible they made a mistake. What if the medical experts and the Roman soldiers were wrong. Even if it were possible for Jesus to survive, how would He be able to free Himself from the burial cloth. roll away the stone and avoid the guards? And then He would have to convince his friends that God resurrected Him. All this with suffering from wounds from the scourging and nail wounds in His hands and feet, and just a couple days sleep to recover! Looking closely, it just doesn’t make sense. Another theory is that it wasn’t Jesus who was crucified, that somehow a mistake was made and someone else died in his place, usually either Judas or Simon of Cyrene (who helped Jesus carry the cross) and that Jesus married Mary Magdalene and lived in Turkey. This theory was put forth by Islam, the fourth sura verse 157 of the Qur’an says “That they said (in boast) We killed Christ Jesus the son of Mary, the messenger of Allah - but they killed him not, nor crucified him, but so it was made to appear to them”. This theory was also picked up by the Da Vinci Code. Again, these theories have many flaws. First although the Roman soldiers who crucified Jesus may not have recognized Him, the priests and Pharisees who tried Him and the people who yelled “crucify Him” certainly would have noticed if the wrong person was on the cross. And even soldiers who had never seen Jesus would be able to tell the difference between someone who had been scourged and someone who hadn’t! Also if we could figure it out over a thousand years after the fact where Jesus was, the Roman and Jewish authorities who wanted Him dead certainly would have heard about it and found him and made sure He was dead. Islam provides a different perspective of possible explanations. According to Islam, Allah either made someone else look like Jesus in His place, or he made the soldiers think Jesus was dead and then healed him in the tomb. This, like Christianity provides a supernatural explanation, so which are we to believe? My first question was, if Allah did it why doesn’t he know how he did it and why doesn’t he tell us? Also the Islamic explanation contradicts it’s self in a couple ways. Islam claims that Jesus was a good man and a high prophet, only Muhammad is higher than Jesus. Well if Jesus was a good man, and even non believers will acknowledge this, why would he let his friends be persecuted and killed because they believed He had risen from the grave when He hadn’t? Wouldn’t He have discreetly pulled them aside and told them the truth? By watching them die and doing nothing, He wouldn’t have been following His own teachings. Islam also claims that Jesus was a prophet, Jesus prophesized his death and resurrection. The test of a prophet is if his prophesies happen. If Jesus wasn’t resurrected, His prophesies fail and he is a false prophet and Islam is wrong. If He was, then the bible is right and Islam is wrong again. Either way you look at it, it just doesn’t make sense. The only thing that logically makes sense is that Jesus was crucified and that God raised Him from the dead after three days. This can be the only logical conclusion. Still people will say that it is impossible for someone to come back from the dead after three days, it can’t be done! I would tend to agree. It is impossible for people to rise from the dead. But keep in mind, Jesus didn’t claim to be an ordinary person, He claimed to be the Son of God himself and his resurrection (something that would normally be impossible) would be the proof of this claim. Only God would be able to pull off something like this! And He did! So the choice is yours, you can continue to believe in illogical beliefs, or you can believe in the truth. That Jesus is the Son of God, that He died for your sins, and that God raised Him from the dead. It’s the only logical conclusion!